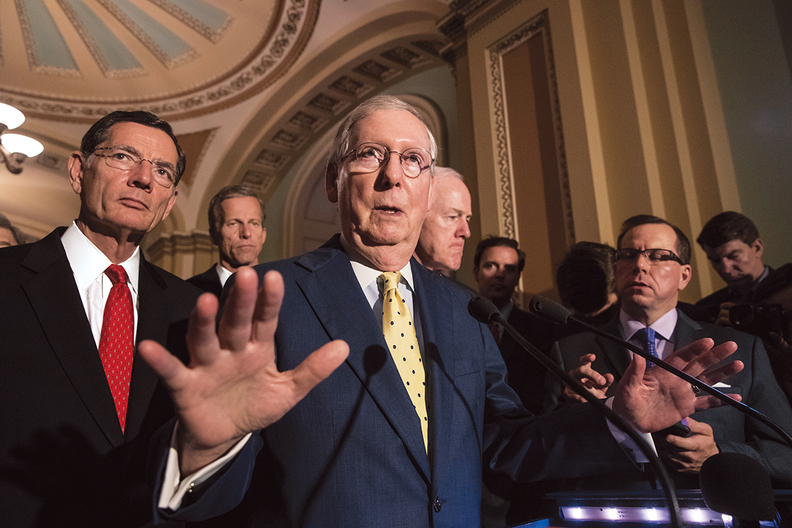 Senate Majority Leader Mitch McConnell (R-Ky.), joined by, from left, Sen. John Barrasso (R-Wyo. ), Sen. John Thune (R-S.D.) and Majority Whip John Cornyn (R-Texas), speaks following a closed-door strategy session at the Capitol in Washington on June 20. Facing rebellion on the left and the right, Senate Majority Leader Mitch McConnell on Tuesday delayed a vote on the Senate replacement for the Affordable Care Act. McConnell hoped to bring the Better Care Reconciliation Act to the Senate floor for debate and a vote this week, so public outcry during next week's congressional holiday wouldn't weaken senators' resolve to repeal the ACA. But after senators from Maine, Nevada, Utah and Wisconsin all said they would vote against a motion to begin debate, McConnell pulled the bill for continued intraparty negotiations. The announcement came during a closed-door GOP lunch. After the lunch, McConnell told the press: "We're going to continue discussions in our conference on the differences we have. We're still working toward getting 50 people in a comfortable place." The decision came just one day after the Congressional Budget Office revealed its analysis of the Senate bill, saying the plan would cause 22 million to lose their health coverage by 2026. The House's American Health Care Act had a similar impact with 23 million projected to lose coverage. "We're optimistic we're going to get to a result that's better than the status quo," he said. All the Republican senators were invited to the White House on Tuesday to talk about replacing Obamacare. The Senate bill does more to drive down exchange premiums than the House bill, thanks to its proposed subsidy system for individual insurance policies, which shifts subsidies to Bronze plans rather than Silver plans. Senate Republicans say people are unhappy with access in the individual market and rising premiums under Obamacare. "While the schedule may have changed a little bit, one thing that hasn't changed: Obamacare is collapsing," said Sen. John Thune of South Dakota. "It's a failed system that needs to be replaced." Thune said the Senate approach to regulating the individual market will "bring affordability to people suffering under the curse of high premiums, high deductibles and high out-of-pocket costs." The CBO analysis of the Senate bill determined that premiums will drop for those who don't qualify for subsidies, but premiums will rise for individuals over the age of 50 who currently qualify for subsidies. In addition, fewer people will qualify for subsidies. Other analysts say that deductibles and out-of-pocket costs will rise, not fall, thanks to their changing actuarial value. The CBO predicted that virtually no low-income people who currently qualify for very low deductibles and co-pays will buy policies under the Senate proposal's regime, since their out-of-pocket costs would rise too high. But Senate Republicans say the current system is unsustainable. Sen. John Barrasso of Wyoming, a physician, said he had a constituent visit his office this morning complaining she and her husband pay twice as much for their policies now, with $6,500 deductibles, than they did before Obamacare. That policy "wasn't good enough for the Democrats," but it was good enough for her, he said. One of the sticking points among Republicans is how to rework the Medicaid program, which some states expanded under the Affordable Care Act. Lawmakers in those states are wary of rescinding the benefits to their constituents and facing a tougher road to re-election. Barrasso said covering childless adults gets away from Medicaid's original purpose and that states need the flexibility to design their own programs. The bipartisan National Governors Association sent a letter to the Senate saying it opposes the proposal to withdraw more than $770 billion in federal Medicaid funding over 10 years by ending enhanced support for the expansion population and constraining the growth in the federal contribution. Those cuts are why Republicans can repeal taxes on health insurers, earners making more than $200,000 annually, and investment income, among others, without increasing the deficit. Providers will feel the impact of Medicaid cuts far greater than changes to the individual market. Dr. Atul Grover, executive vice president of the Association of American Medical Colleges, said that his member hospitals, which are 5% of all hospitals, cover 24% of Medicaid patients. Although the Senate bill preserves and increases disproportionate-share hospital funding in non-expansion states, that won't make up for the Medicaid cuts. If Congress rolls back Medicaid support and millions are pushed off the program, "We're not going to turn these patients away," Grover said. "That's not who we are."